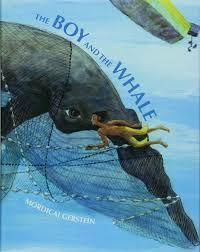 The Boy and the Whale tells the tale of an empathetic young boy who has to make a difficult decision. Does he obey his father or try to save a dying whale’s life? The vibrantly colorful illustrations bring the reader right in to the story and give a humanizing presence to the trapped whale and its large, sad eyes. This story gives a glimpse into life in a fishing village story and succeeds in teaching compassion toward animals and the effect that humans can have on other living creatures.